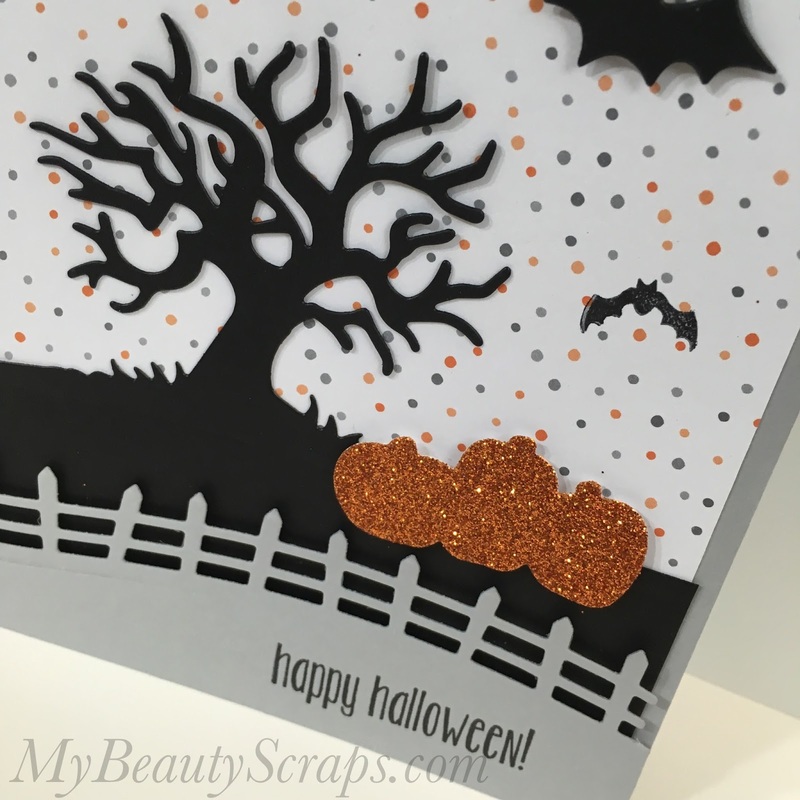 In this month's Card Class we are creating 2 cards & 2 treat bags. Today, I wanted to give you a closer look at card #1. 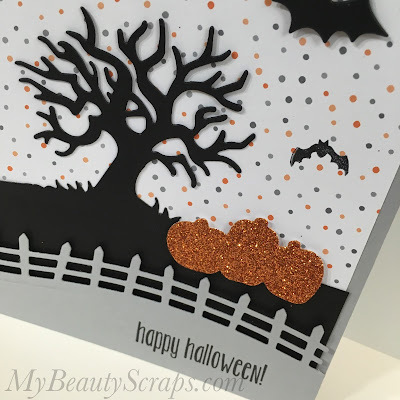 This card really shows off all of the fun die cuts created with the Halloween Scenes Edgelits Die Set. All of the pre-cut pieces to create this card will be included in your class kit, so you don't need to have a Big Shot or purchase the die set. But, if you have a Big Shot I absolutely recommend getting the die set as an add on to your kit this month! 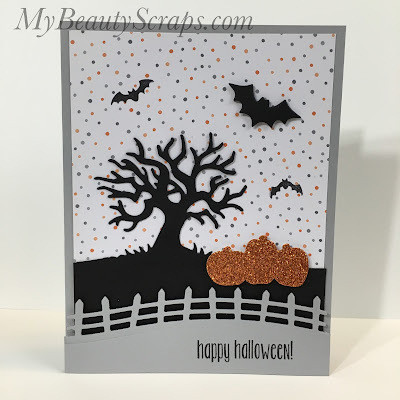 It works so well with the Spooky Fun stamp set to create fun scenes like this one! 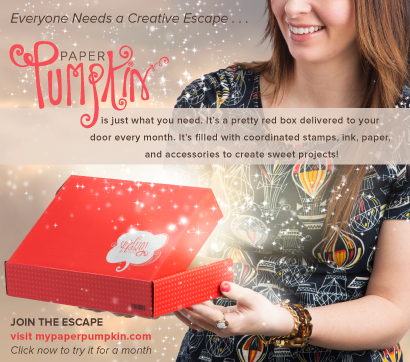 Here's a closer look at the die cut pumpkins, cut from the new Pumpkin Pie Glimmer Paper. I just love this paper! All of the fun of glitter without the mess! In this month's class we are creating 2 cards and 2 treat bags. 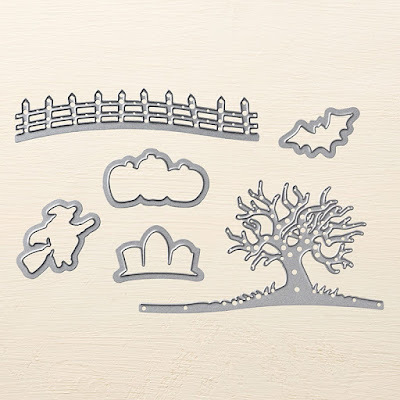 You will receive the die cuts you need to create the projects in the class kit, but if you have a Big Shot you should consider adding on the edgelits dies. 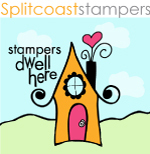 They are so fun and will stretch the creative possibilities of your stamp set even further! If you would like to add on anything else that I haven't listed above, just let me know and I'll send you a revised invoice. Contact Me by the September 25th 2016 to order your kit for BeautyScraps Spooky Fun Card Class! I'm so excited to get started! As always, feel free to Contact Me with any questions you have.